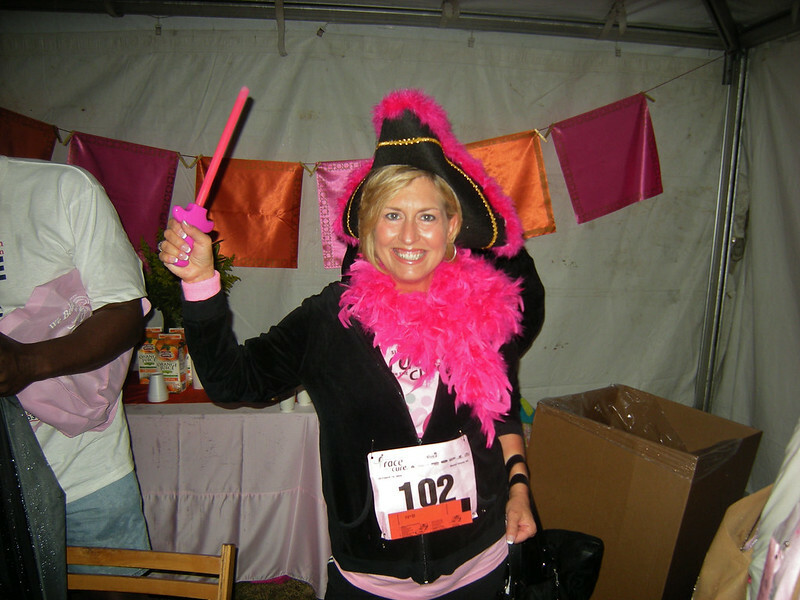 This was my third year in the Charleston, South Carolina Race for the Cure. I looked at my other two races before writing this article, and I’m a little disappointed that this year’s weather didn’t match up with those. 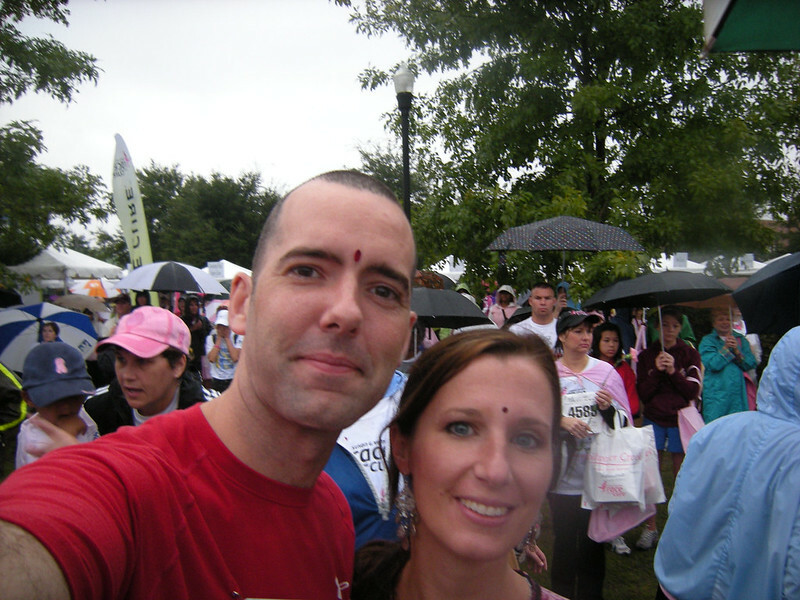 For a look at those races, you can read my articles about the 2006 Race for the Cure, and then the 2007 Race for the Cure. 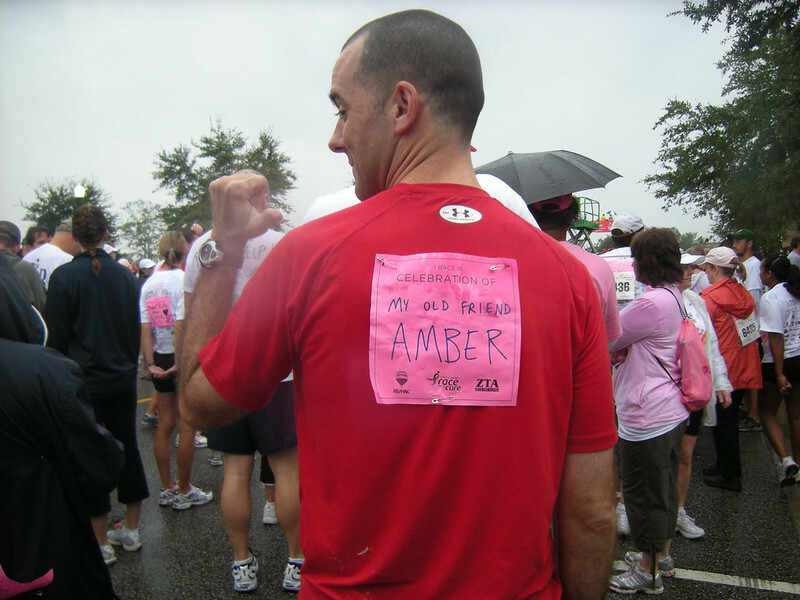 This race is kind of special for me anyway, (as you can read in the previous two articles) but this year was a little different in that I actually know someone who’s dealing with breast cancer. This year, I ran with a name on my back. Sheri is my shift supervisor at Starbucks, and this year she was volunteering for the race. We were going to provide some coffee for the Survivor’s Breakfast. She figured that I would probably be there to run, but she asked if I wanted to join in anyway. I usually get up early before a race anyway, so I offered to help her get the gear to the site. My feet were already wet and I was a bit cold. I’ve trained in weather much worse than this, but before and after I was comfortable in my apartment. This time, I had to walk around with wet feet for more than an hour. It kind of sucked. Still, it was nice to see the familiar setup for registration. Among the tables and shirts, I saw several familiar faces, reminding me that Charleston really is a small town. Two things were different this year besides the weather. First of all, they didn’t use the old style of timing chip. Instead, they had these little strips that you peel off of your race number. They were more compact and probably less expensive than the older chips. The breakfast was fun. I waited there for a while after registration because I could chat with my co-workers and keep out of the rain. I missed the opportunity to wander around and hang out with the usual race crowd, but there would be time for that after the race. At the moment, I had cold feet and I didn’t want to be rained on. Below, you can see one of the more fun survivors. She said that she had a whole team called the Pink Pirates, but the others hadn’t shown up yet. It’s too bad. I would have loved to get a team photo. Wrecking the National Anthem… AGAIN. 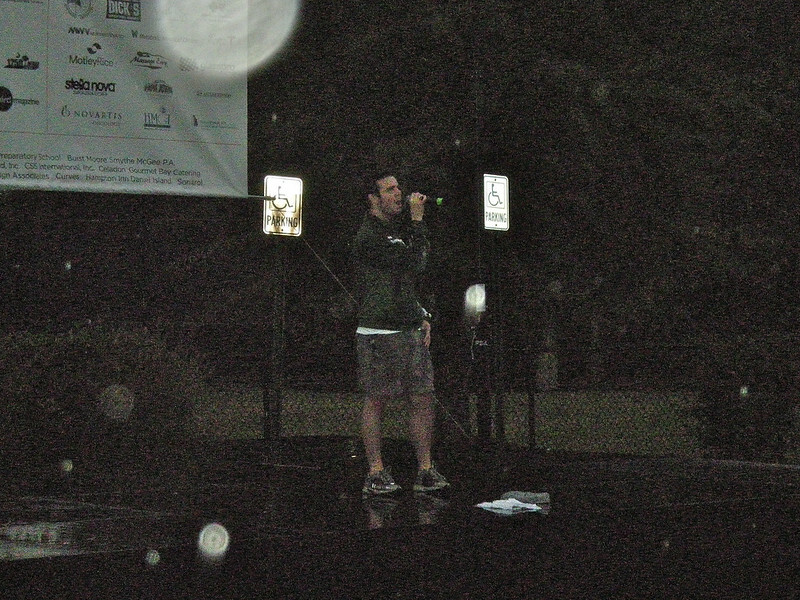 I can’t remember this guy’s name, but they said that he was a finalist on American Idol. I’m not sure if that’s something one brags about, but he apparently does. Last year he wrecked the national anthem by attempting to do a Whitney Houston version, even though he’s very white and also a dude. It went about as well as you think it did, especially during the difficult parts of the song. I wanted to get some video, or at least a picture this time. You know, just to sort of document what was happening. When I finally got past the crowd of people who were (unlike me) standing still with their hands over their hearts, the song had almost reached its merciful end. I only had one shot before he finished, and you can see how it turned out. It could have been my camera, but I prefer to blame his singing. It messed up the lens somehow. On the right, you can see how he reacted when he realized that somebody would have a record of what he looks like. Maybe he was just waving to people… or maybe he was hiding his face because of what he had just done to Francis Scott Key. Because of the rain I didn’t wander among the vendor tents as I did in past years. I don’t know if they were even painting people this year. I still wound up with some sort of facial decoration, however. There were belly-dancers at the Survivor Breakfast. There was no show, but they were still there in force. The person you see on my left is responsible for putting that dot on my forehead. I was explaining to her that I didn’t want a dot, and she responded by dotting me before my sentence was over. I figured that it could act as a replacement for the ribbon, so I wore it for a while. You know the drill by now if you’ve read the other articles. The Pink Ladies all get together on a stage while local radio and TV personalities make jokes that aren’t funny, and eventually everyone dances to and sings along with that same old Melissa Etheridge song that I’ve grown to hate… which is repeated numerous times. Now don’t get me wrong. These people have every right to be emotional about the subject matter. But is it too much to ask that the speakers make funny jokes and that we expand our musical options a bit? Even a good song can be played too often. A friend of mine from Elementary school found me on Facebook. It’s always a bit weird when that happens, since so much time has passed. It was nice to hear about the husband and the kids, but it wasn’t so nice to find out that she’s currently going through chemotherapy. It’s not much, really, but I thought it would be nice to wear one of those pink signs on my back with her name on it. After the photo of my back, I had time for maybe two or three crowd shots before my camera’s batteries gave out. I thought they were full, but these rechargeable were kind of old and you can’t just keep using them forever. Still, they’ve saved me tons of money and they’ve saved a bit of space in the landfills. I ran the first mile rather quickly, but slacked off on the others. I’ve been training for long, slow runs, and that’s very different from speed work. Of course, I had started the day without any desire to break my personal record of 22:47. And of course, I changed my mind once I was out there. In the end, though, it came to a choice. Am I willing to throw up in front of these people? If so, then I could probably shave a bit of time off of the race. I considered it for a couple of minutes, and eventually decided to stick to the plan of a normal finish. I still sprinted across the Finish Line, though. That’s a proper finish. According to my wristwatch, my time was 23:36. It’s not a record, but it’s not bad. I went back to the Survivor Tent after the race to change the batteries, but it was no good. I had some moisture in the camera. (I have an Accidental Damage Plan at Ritz Camera, though. No worries.) Since that was out, I put the camera in my race bag and went back to the Finish Line to check on the people who were coming in at the 30-minute mark. I always enjoy watching folks as they cross the line. I can see my own history in them. Every stage of speed and fitness plays out before me in reverse, with each person in their own pace, competing against their own best times, just like I did. Some of the faster folks still hang around after they finish, though, so I was able to hook up with a few of my friends from the other Charleston races. We chatted, compared times and discussed past and current injuries before heading over to the bananas and apples. It was nice. The parking lot was little more than dirt with a light coat of grass. Once the first few cars and trucks had churned it up, it became a maze of quicksand. Anyone without a 4-wheel drive vehicle was stuck. Even a low profile was enough to get you into trouble. As Sheri and I approached my car, we saw a guy in a front-wheel drive car who was in pretty deep. I tried to push the car from every direction, but it was no good. He thanked me, called a friend with a pickup truck and told me he would be okay. I nodded, waved, and then proceeded to get my own car stuck in the mud. It would have been a lot funnier if I hadn’t been cold, wet and miserable at the time. Still, karma is a funny thing. His friend arrived moments later, and I heard him say “Yeah, he tried to help me….” To sum up what has become a long story, I pushed again while the truck pulled. The strap held. We got him out, then we got me out, and after that we helped some lady in a small red car get out. After her, they left before helping people became a career. After all of that, I was not only cold, wet and miserable… I enjoyed the extra bonus of being covered in mud. It was okay, though. Helping people out puts a positive spin on the day. The only thing that ruined it was the return to Starbucks to drop off those green containers. No one wanted to hug me in celebration. Oh, they made plenty of excuses. I was covered in mud, I smelled like a swamp, I was all sweaty and wet, etc. It’s sad, but after a race there’s just no love.